Sixteen months ago I left my eight-year career in publishing to pursue writing. To hold myself accountable, here’s how I spent that time. 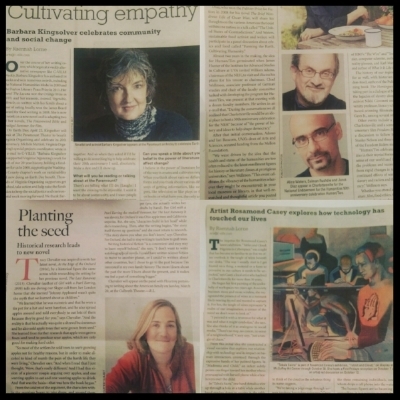 I wrote 40 articles, interviewing visiting writers such as Kwame Alexander, Junot Diaz, Kaitlyn Greenidge, Barbara Kingsolver, and Tracy Chevalier. We discussed literacy, politics, race, social justice, and fiction as truth, my worldview challenged and expanded. I received my first press pass. I met and interviewed dozens of visual artists, ranging from book artists to filmmakers and figurative painters. As the daughter of a librarian and a painter who has always understood words better than pictures, I wasn’t confident in my ability to write about the visual arts. But each time it was a joy to peer through the lens these artists hold to the world and to articulate that lens for others. I averaged 2.5 articles per month, yet I spent more time in these last 16 months consistently writing than I have since leaving college with a degree in English ten years ago. I earned enough to require receipt of a 1099-MISC form, yet not nearly enough to live on, which necessitated many hours of non-writing employment to pay the bills. I cashiered at a specialty grocery store, sneaking far too many bites of Cadbury caramels and fruity chews purchased with my employee discount, and learning how not to suffer cuts when packing paper bags. I revised my novel and sent it to its first reader. I worked in a catering office by myself beside the train tracks and coordinated wedding dinners, the chaos of the events themselves a frenzied contrast to the loneliness of the office—particularly the night my hands weighed down a full trash can while a server yanked the bag out and the jagged edge of a broken bottle sliced my thumb where the joint met my hand. I received feedback on the novel. I let the novel sit. I wrote 18 blog posts about our town for a real estate company, learning about turkey farming, land conservation, and the art of making coffee in the process. I took a 1600-mile road trip with my husband, during which we bought an old electric typewriter at a yard sale in Massachusetts, explored beautiful Montpelier, Vermont, pretended to know French and fell in love with the Jardin Botanique in Montreal, and toured his childhood haunts in upstate New York. We ate baguettes with butter and cheese, sought out homemade chocolate, petted kittens for adoption at a gas station, tested our relationship on a rock scramble, and basked in our unfettered days. I packed up boxes of my in-laws’ belongings in the house my father-in-law built and in which they had lived together until they put it on the market and quietly separated two years prior. The separation now known, I moved his boxes to his new house, and her boxes to hers. My husband and I put yard sale signs up in our neighborhood and laid the things neither of them cared to take on our lawn. Their house finally empty, I said to my mother-in-law, “I felt like I was packing up your marriage.” She said, “In a way, you were.” I sang in the empty rooms as I have in every house, apartment, and townhome I’ve left bare since I was 12. In this way, I like to think, I am not leaving them empty. I cleaned the house of a hoarder that had not been cleaned in 20 years, scraping petrified stacks of cashews off of bookshelves with a putty knife, the remains of intricately constructed mice villages. I became intimately acquainted with the dark color and filmy texture of decades’ old dust (or as intimately as was possible from behind my teal face mask and rubber gloves). I started writing marketing copy part-time for the real estate company I blogged for. I let the novel sit. My husband and I packed up our own belongings, loaded them into our cars and onto a friend’s trailer, and moved in with my father-in-law to cook him meals and keep him company as he underwent a new immunotherapy treatment. A few weeks later, my father-in-law stopped treatment. I watched him slow down and quietly stopped blogging for pay. Every morning the dog and I walked down the hill to fetch the newspaper and laid it for him on the coffee table. On my writing days at home, I waited for him to rise and settle in the den, then brought him tea and Danish. In the afternoons I brought him clam chowder or a hotdog with Koop’s horseradish mustard, the only other things that tasted good to him anymore. I worked in the living room while he watched TV on the other side of the wall. I listened, sitting at the edges of things. My husband came home and made us dinner and we ate in front of Jeopardy, my father-in-law knowing the answer to almost every geography question. My father-in-law stopped getting out of bed. On days when I went to work, I’d sneak in and lay his newspaper and cell phone down beside him before I left. He usually awoke, and wished me a good morning. When the Hospice nurse came to visit, I stayed home and took notes. Friends and family visited, the house flush with their energy, our fridge stocked with food we did not make. My father-in-law stopped breathing. I lost a wise and loving father figure. I witnessed, helpless, the person closest to me go through the most devastating loss of his adult life. I stared at the brown and bare woods surrounding our house, and did not see my father-in-law anywhere. I canceled my father-in-law’s newspaper subscription. But then I forgot. The first time the dog and I walked down the hill to get the newspaper that wasn’t there, my mouth ejected a word unbidden, “Oh!”, my navel pulling up against my spine. And then I cried. In a burst, green leaves opened and white and pink blossoms sprung up around our house, and I saw my father-in-law in them, and in the blue sky. I smiled at him and wished him a good morning. I listened to what I wanted and gave up trying to earn a partial living commercial blogging. I tired of sitting at a computer so much, and if I was going to do it at all I’d rather spend that time writing what I wanted to write. I missed interacting with people and started hosting at a restaurant two evenings a week. Somehow, I ended up with more energy at the end of those longer days than on the purely sedentary days. Here, I learned how to run food, too, and prepare coconut rice. One night I cut the tip of my thumb on the open lid of a can of coconut milk. The same thumb I cut catering last summer. I appreciated the parallel. And with that battered thumb, I opened the novel again.